China’s government is cracking down on the religion in a bid for control. Over the course of the last two and half years, the Chinese government has shown signs of increasing nervousness and wariness of the growth of Christianity. In its latest grasp for control, the government has taken Christian churches in Zhejiang province to task, by removing the crosses that adorn some 1,700 churches. Citing breach of building codes, the government sent in police SWAT teams to remove the crucifixes from spires. Officially, the Chinese Communist Party is atheist. Early last month, Xi Jinping made a speech on religious policy stating, “We must resolutely guard against overseas infiltrations via religious means and prevent ideological infringement by extremists.” Xi demanded that all religious groups submit to the ruling party and that religions must become Chinese. This stance is in line with the CCP’s long-held objective of controlling belief systems. 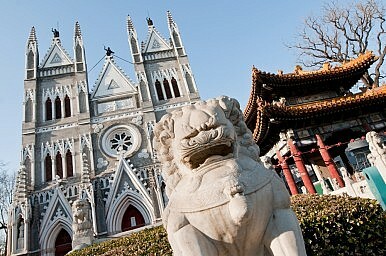 Though official government figures puts the number at around 23 million Christians in 2010, a Pew Research Center report estimates that there were, in fact, close to 68 million Christians in China — an astonishing number considering the growth of Christianity has largely been by way of faith conversion. As the country has become richer, it has also become more educated, with increasing numbers of students returning from overseas study, bringing home their new found faiths. Sixty-eight million followers equates to approximately 5 percent of the Chinese population, which makes Christianity an increasingly influential proportion of society – and a source of consternation for China. In his 2015 article in The Guardian, religions reporter Andrew Brown made the observation that, much like King Henry VIII, who sought to gain control of Catholicism in England, the Chinese government seeks to control Christianity in China. Unlike the fifteenth century English king however, Christianity is now no longer a centralized belief system under one universal pontiff (or even two). Rather, Protestantism, the overwhelmingly dominant force in Chinese Christianity, is a scattered myriad of independent, nodal leaders. “The decentralized structure of this form of Christianity helps it to grow and spread, but also makes it much harder for governments to cut lasting deals with it,” Brown wrote. For its part, the Chinese government is trying to implement some semblance of structure. It has had a long-standing battle with the Vatican for control of Catholics in China. As far as Protestants go, the government has sanctioned its own governing ‘church’ known as the “Three-Self Patriotic Church” — only those who belong to this organization can officially register as Protestants. Despite the official state-sanctioned title, unrest has been felt within this organization too, with the majority of crucifix removals are coming from its institutions. In Hong Kong, where religious freedom is enjoyed by all, signs of China’s political reach have also come to the surface in recent months. One of the city’s most influential denominations, the Anglican Church, withdrew from their decades-old association with the liberal-leaning Chinese University’s theology school. Many believe this decision was triggered after the school issued a statement calling for the release of one of their students arrested for anti-Beijing riots in February. The Anglican archbishop Paul Kwong’s role as the local delegate to the Chinese People’s Political Consultative Conference, China’s top political advisory body, has also been associated with the withdrawal. However, the Church has denied these accusations, saying instead that they wish to develop their own college. So far, the cross-removal campaign has been limited to Zhejiang Province in China’s east, home to the country’s largest Christian population. But many fear that this is just the beginning of ever increasing persecution and restrictions on the practice of the Christian faith. Could an economic crisis in Wenzhou bring about dark times for China's Christians? Christian Theology: Made in ChinaVatican Renews Overtures to China Ahead of Xi’s Italy VisitGrinch China: Three Decades of China’s Problem with ChristianityWhat the China-Vatican Deal Means for TaiwanChina and the Vatican: Towards a New Era?